The CIA's hunt is on for the mastermind of a wave of terrorist attacks. Roger Ferris is the agency's man on the ground, moving from place to place, scrambling to stay ahead of ever-shifting events. An eye in the sky - a satellite link - watches Ferris. At the other end of that real-time link is the CIA's Ed Hoffman, strategizing events from thousands of miles away. And as Ferris nears the target, he discovers trust can be just as dangerous as it is necessary for survival. Leonardo DiCaprio (as Ferris) and Russell Crowe (as Hoffman) star in Body of Lies, adapted by William Monahan (The Departed) from the David Ignatius novel. Ridley Scott directs this impactful tale, orchestrating exciting action sequences and plunging viewers into a bold spy thriller for our time. $12.884 million on 2710 screens. With Ridley Scott behind the camera and both Leonardo DiCaprio and Russell Crowe in front of it, 2008’s Body of Lies looked like a sure-fire hit. Apparently there aren’t any guarantees in Hollywood. Lies earned a weak $39 million and received a grand total of zero Oscar nominations. It came, it saw, it disappeared without a trace. Whether that’s a shame remains to be seen. Lies follows the relationship between Roger Ferris (DiCaprio) and Ed Hoffman (Crowe). As the CIA pursues terrorist mastermind Al-Saleem (Alon Aboutboul), Ferris acts as the ground operative in the Middle East while Hoffman consults with him via the “eye in the sky”. After one mission almost kills him, Ferris ends up on assignment in Jordan. As Ferris gets involved, he finds many of complications, some caused by Hoffman’s side endeavors. Ferris tries to do his job and stay alive while he also attempts to figure out who he can trust. With its use of satellite technology, Lies often comes across like a more serious riff on 1998’s Enemy of the State. Is it a coincidence that Scott’s brother Tony directed that popcorn flick? Perhaps, but the two deliver a certain similar feel; I couldn’t help but flash back to State as I watched Lies. While State took a more fantastic, Hitchcock-influenced view of technology, Lies tries to exist in the real world. And perhaps it does; I thought the antics of State stretched credulity, whereas Lies comes across as much more believable. Unfortunately, that doesn’t mean it works as much more interesting. State offered a certain level of simple fun, while Lies takes itself much more seriously. Too seriously, to be honest, as the film’s pretensions threaten to undermine it. Lies wants to be an insightful, revealing take on anti-terrorism, but it lacks the substance to back up its aspirations. Lies comes with a rather muddled story. I understood the overview but the details became clouded along the way. Perhaps I’m just slow, but I think the filmmakers dropped the ball here. At its hearts, Lies offers a pretty simple tale, but Scott seems to want it to be less intelligible so it’ll appear more complex. There really isn’t anything particularly clever or insightful here; the confused narrative just leads one to think it’s more three-dimensional because it buries us in details. All of that’s too bad, as a terrorism-based thriller could be pretty interesting. Scott certainly brings the usual high level of production values to Lies, and one can’t fault the film’s star power. Neither Crowd nor DiCaprio provide particularly strong performances, though I’m not sure how much room they have to breathe here. Poor Leo gets stuck in scenes where he’s supposed to pass for an Iraqi; that could look sillier than it does, but it’s hard to imagine. My main problem with Lies is that it’s a thriller that never becomes thrilling. If it took a more focused approach to its subject, it might’ve become more involving. Unfortunately, it feels scattered and surprisingly dull. 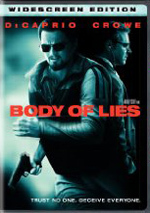 Body of Lies appears in an aspect ratio of approximately 2.35:1 on this single-sided, double-layered DVD; the image has been enhanced for 16X9 televisions. Across the board, the movie boasted a fine transfer. Virtually no issues with sharpness materialized. Softness was essentially non-existent, as the majority of the flick looked concise and accurate. No signs of jagged edges occurred, but I saw a little shimmering from some Muslim caps and a smidgen of edge enhancement. Except for light grain, source flaws were absent from this clean presentation. Colors varied dependent on the setting. Middle Eastern scenes tended to be a bit amber or gold tinted, while CIA-related shots took on a bluish tone. Those hues dominated the film in a quiet manner but the they still came across as warm and full through the film. Blacks were also deep and firm, and shadows looked smooth and clear. This image consistently impressed. As for the Dolby Digital 5.1 soundtrack of Lies, it also was fine for the movie. The soundfield made good use of various effects. Of course, gunfire and explosions created the majority of the material. These elements opened up the mix well, and the track used music in an active, satisfying manner as well. Throw in a few vehicle sequences and the soundscape worked nicely. Audio quality always seemed solid. Music was full and rich, with clear highs and tight lows. Effects sounded accurate and dynamic as well, and speech was good. Dialogue came across as natural and concise. All of this was enough for a “B+”. The DVD opens with a few ads. We get promos for Blu-Ray Disc, Pride and Glory, RocknRolla, and Watchmen. No trailer for Lies appears here. No other extras accompany this single-disc release. However, a two-disc version with a commentary and featurettes also exists. Hopefully I’ll be able to review it soon. For a thriller ripped from modern headlines, shouldn’t Body of Lies provide a dynamic flick? Yeah, it should, but it doesn’t. Instead, it remains moderately interesting at best, and fairly dull at worst. The DVD provides strong picture and audio but includes no significant extras. Chalk up Lies as a disappointment.